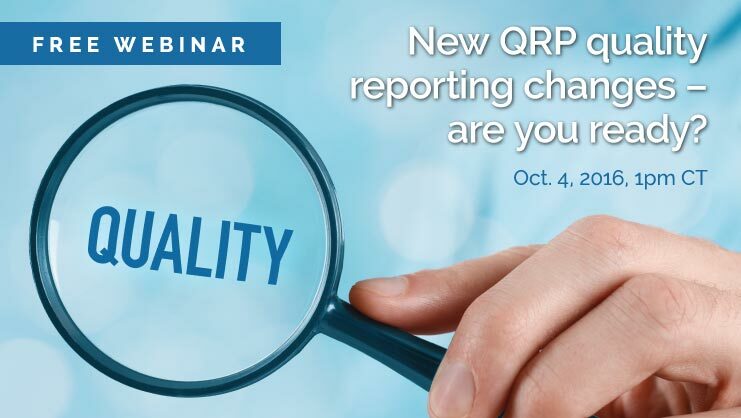 [On-demand webinar] New QRP quality reporting changes – are you ready? Learn the details of the new MDS 3.0 Quality Reporting Program (QRP) measures, which took effect Oct. 1, 2016. The SNF QRP measures are the first experience long-term care providers will have with the IMPACT Act of 2014. Topics include the differences between QMs and SNF QRPs, details of the individual QRPs, tips and tricks for proper coding, and a brief demo of how SimpleAnalyzer™ helps you proactively address quality measures and quality scores. What’s the difference between QMs and SNF QRPs? What are the SNF QRPs? Mary Madison is a registered nurse with over 43 years’ experience in the healthcare field, including 40 years in long-term care. She has held positions of Director of Nursing in a 330-bed SNF (also managed the RAI/MDS process in this facility), DON in two 60-bed SNFs, Reviewer with Telligen (Iowa QIO), Manager of Clinical Software Support, Clinical Software Implementer and Clinical Educator. Mary has conducted numerous MDS 2.0 and 3.0 training sessions across the country in the past two decades and remains passionate about the RAI process, providing consultation and education on the Item Sets and related activities.